Available for all organizations using Amplitude. In beta, a new layout for Amplitude that’s designed to put the things you care about front-and-center, and simplify your workflows. One of the major improvements is a streamlining of how analyses across Amplitude are created. In the new layout, charts, cohorts, user lookups, dashboards, and notebooks are all created from one places that you can spend more time getting things done, and less time navigating to them. We’d love your feedback on the new layout over the next few months as we’re still building it out! Click the “Beta” pill to leave a comment that goes to our development team, or opt-out of the new layout entirely. A space to share analyses with your team! Available for any organization using Amplitude. Analytics is a team sport, and some of the most valuable analyses are collaborations among teammates. Team Spaces help product teams collaborate on the analyses relevant to them. Once your space is set up, you can use it to organize the top KPIs for your team, and invite other teammates to stay up to date. Members of a team space will be notified whenever new content is added! Lastly, you can connect a team space with a Slack channel so that when new content gets added, Slack notification is shared on the channel. Tell a story with your data, with Notebooks! Notebooks help you to tell the story in your data. Unlike Dashboards, which are great for monitoring metrics, Notebooks are dynamic documents, combining charts with headers, text, and call-outs. Notebooks let you communicate the important takeaways without copy-pasting, constantly refreshing data, fumbling with formatting in spreadsheets, and wrangling with PowerPoint. We’ve introduced Notebooks so you can share the story - the context, insights, learnings, and impacts - with your teammates! Available for Admin users in all organizations using Amplitude. Admin users can now export the list of Amplitude users in their organization from the Team Members page in your Org Settings. Amplitude now supports custom session IDs for viewing session length information in the User Sessions chart. Visit your Project Settings page to configure which event or user property to treat as the session ID. Amplitude defaults to using the “Session ID” property, which you can set manually, or automatically via our SDKs. Visit the documentation to learn more. This feature is available for all paid customers. Amplitude previously supported creating a cohort by uploading a list of user ids or Amplitude ids. However, when it came time to update that cohort, you were pretty much out of luck. Not anymore! We now support updating an existing cohort with an updated list of ids. Today is your lucky day (and you didn’t even know it until just now). Take a look at our documentation to learn more. Are you downloading large cohorts? Do you need those downloads to complete quickly? Well, you’re in luck! We recently made our behavioral cohort download asynchronous, allowing for the download of much larger cohorts than our old API. We have updated this API to make it up to 50x faster. Take a look at our documentation to learn more. Many of our Customers have seen tremendous success expanding data access within their organizations by leveraging Taxonomy to categorize and describe their data. Yet keeping an organization up-to-speed on the meaning of data can be a tall order, especially with multiple tools within an analytics stack. That’s why we built the Taxonomy API to let you programmatically keep your Taxonomy up-to-date and in-sync with all the other tools within your product stack. Take a look at our documentation to learn more. Our existing Braze integration was great if you just needed to send a one-time email or push notification to a static cohort of users. However, many of you wanted to be able to target your campaigns at dynamically updated behavioral cohorts. We listened, and recently launched daily and hourly syncing of behavioral cohorts with Braze. Take a look at our documentation to learn more. 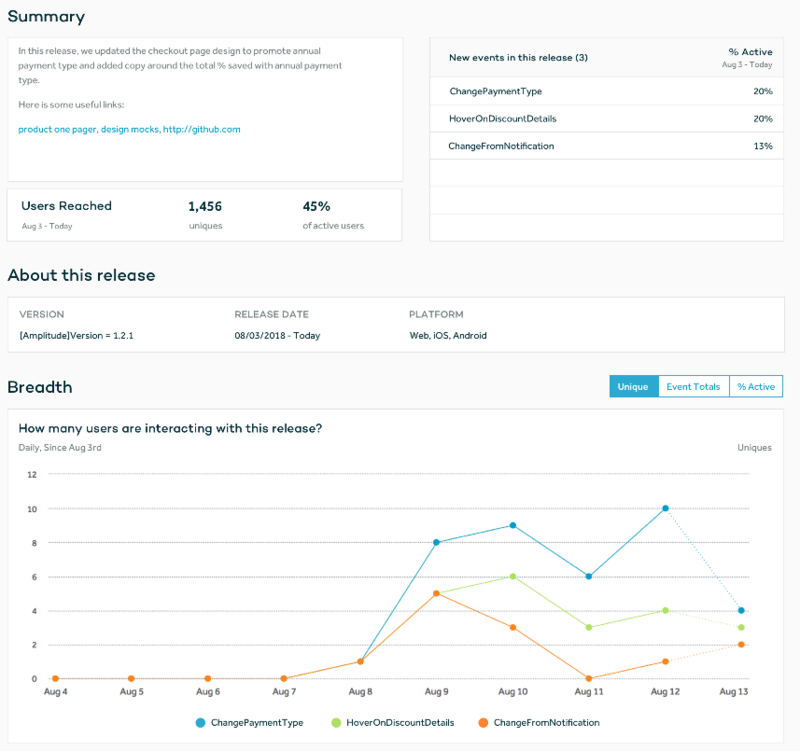 Email release-analysis@amplitude.com to learn more and signup for the Beta! Understanding the impact of product changes can be a challenge for product teams - especially as new priorities arise and you refocus your development efforts. Each release is an opportunity to measure impact, but surfacing release-specific insights can be manual and time-consuming. We’ve got this - we’ll now automatically deliver analysis for each of your releases. When Amplitude detects a new value for the Amplitude Version User Property, we automatically create a Release and create a report on its rollout. See what new events have been captured, what Users are performing those events, and even see how behavior has changed between releases. Not using the Amplitude Version User Property? Get in touch and let us know how you distinguish product updates in Amplitude. This Beta is available for all paid customers. Amplitude helps you understand user behavior within your application. However, there are a number of outside events, like push notifications and email campaigns, that can have an important impact on user behavior but aren’t visible within Amplitude. As a result, many of our most-requested integrations are marketing automation solutions. We have partnered with Iterable to add the ability to push events from Iterable campaigns back into Amplitude, allowing you to see cause and effect in one place. Paul is on the product team at Amplitude. Previously, product @StrideHealth, product analytics at @Square, and Harvard math & computer science. When not digging into retention curves, Paul likes to play chess and jog along the SF Embarcadero. Amplify 2018 was a huge success! This year, product leaders from Amazon, Netflix, Google, Uber, Box and more shared philosophies and frameworks for product growth.